You might have noticed a little change this week… Trash Bubble posts will happen on Thursdays from now on. It became difficult to post back to back on Mondays and Tuesdays, so I decided to split it up a bit. Hope you don’t mind. Batman is near and dear to my heart for many reasons, not the least of which is my grandson, Noah. Every Wednesday, he implores me to play Batman, almost from the moment his feet hit the floor in the morning. For months, I WAS Batman when we played. Noah preferred to be Robin. Once the female characters of Harley Quinn and Cat Woman were introduced, and Noah heard my versions of them, I rarely played Batman again. This week’s Trash Bubble pays homage to the Batman character as portrayed by Adam West in the Batman classic TV series. 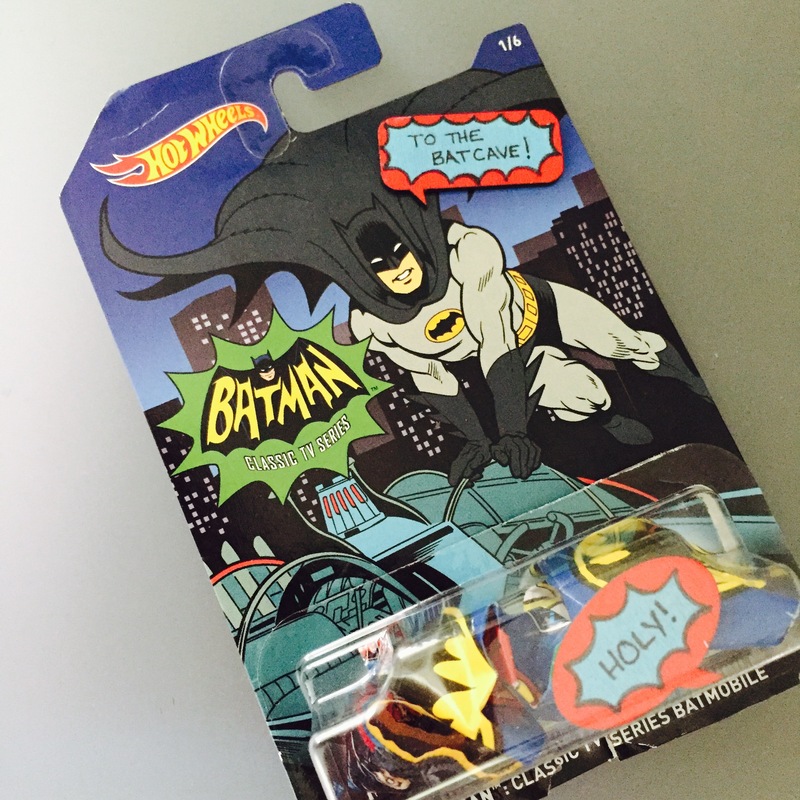 It began with the Hot Wheels package for the Batman Classic TV Series Batmobile. A lollipop wrapper featuring Batman’s mug and a scrap of wrapping paper sporting the Bat Signal became the Holy! contents. The back was pretty busy. I almost hit it with a coat of black gesso, but then, as I really looked it, and read it, I was inspired. 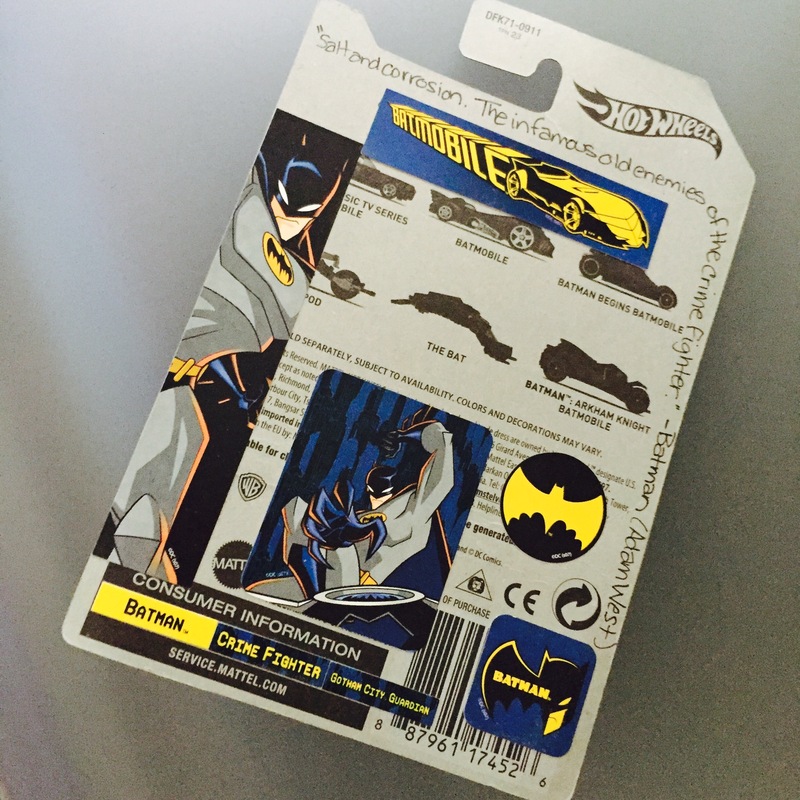 Once I was done applying Batman stickers, ( a leftover from my daughter’s Batman days) I added the perfect vintage Batman quote: “Salt and corrosion. The infamous old enemies of the crime fighter.” – Batman aka: Adam West. This entry was posted in Thursday Trash Bubbles and tagged Adam West, Bat Signal, Batman, Batman Classic TV Series, Batmobile, Crime Fighter, Holy! To the Bat Cave!, Hot Wheels, Instagram, Pop Art, Thursday Trash Bubbles, trash, trash bubble by lkr1995. Bookmark the permalink.